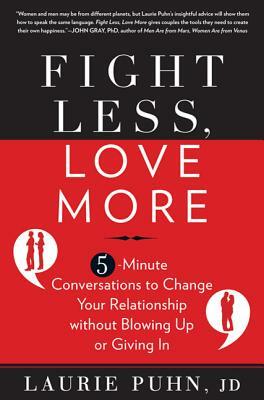 Harvard-trained lawyer and family and divorce mediator Laurie Puhn shows busy couples how to stop fighting and start communicating. It happens every day—a simple exchange or harmless response turns into a heated debate or worse, an all-out battle. Hard-pressed for quality time with our partners and spouses, it's easy to fall into a poor communication routine. How can two people who love one another so much have such difficulty talking to one another? Drawing on her expertise in legal mediation and conflict resolution, Puhn's fresh approach gives simple, 5-minute conversations that will instantly improve communication—as well as the quality of relationships. In Fight Less, Love More, learn how to identify and conquer the poor verbal habits, instinctive responses, and emotional reasoning that can cloud judgment and ultimately lead to the deterioration of otherwise healthy relationships. Love is conditional, argues Puhn, and for love to survive, couples don't need to talk more—they need to talk better. With exercises, examples, and sample scripts, Puhn's simple 5-minute strategies promise immediate results and provide long-lasting communication skills that couples can confidently employ when faced with future conflict. LAURIE PUHN, JD, is a Harvard-educated family lawyer and couples mediator with a private practice in Manhattan. She has made numerous national television and radio appearances, including the Today show, 20/20, Fox News. CNN, and NPR, and her advice has appeared in such magazines as Good Housekeeping, Redbook, Real Simple, Women's Health, and the New York Times. She also conducts empowering relationship communication seminars and workshops nationwide.